Volvo Trucks is launching a new member of the I-Shift family: I-Shift with crawler gears. The new gears, which are added to the automated transmission, provide exceptional start-ability for trucks carrying heavy loads in demanding situations. The system is entirely unique for series-produced heavy trucks. 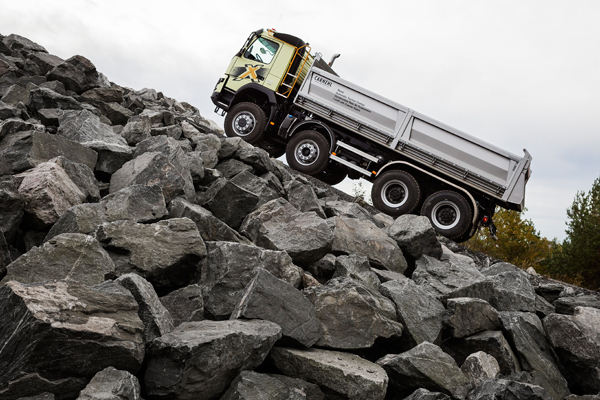 Volvo Trucks' new version of I-Shift makes it possible to add up to two new crawler gears. This means, among other things, that the truck can move off from standstill and transport a gross combination weight (GCW) of up to 325 tonnes. "The vastly improved driveability and start-ability with the new crawler gears makes the driver's job far easier when operating in difficult terrain on slippery surfaces with heavy loads, such as at construction sites, in mines or in forests. The heavier the transport operation and the poorer the surface or the terrain, the more the driver gains from a truck with crawler gears," explains Peter Hardin. For haulage firms carrying out heavy transport operations on demanding surfaces as well as regular highway driving, crawler gears also offer considerable flexibility and the possibility of improved fuel economy. "I-Shift with crawler gears makes it possible to start off from standstill in extreme situations. Combining them with a suitable rear axle ratio that optimises engine revs at high speeds results in lower fuel consumption on the highway. This is a significant benefit to haulage firms doing this kind of work," says Peter Hardin. - The new version of I-Shift has been specially developed for excellent start-ability and for driving at particularly low speeds. - I-Shift with crawler gears can allow driving as slowly as 0.5-2 km/h and can handle starts from standstill with a gross combination weight of up to 325 tonnes, which is unique for series-produced trucks with automated gearboxes. - The transmission is available as either a direct-drive or overdrive gearbox with one or two crawler ratios. It is also possible to specify two extra reverse crawler gears. 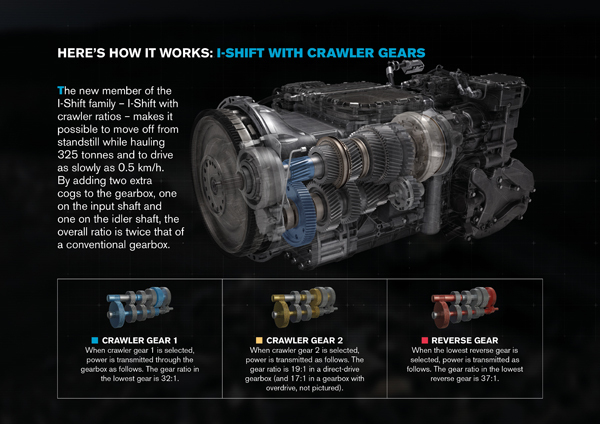 - The crawler gears are integrated into the I-Shift transmission. In order to handle the high loads involved, several components are made of high-strength materials. The gearbox is 12 cm longer than a conventional I-Shift unit. - I-Shift with crawler gears is available for Volvo Trucks' 13- and 16-litre engines in the Volvo FM, Volvo FMX, Volvo FH and Volvo FH16.